Statistically, approximately 0.5% of all banknotes in circulation are replacements. This has been measured by survey both in Ireland and in the US, and probably elsewhere also. Irish replacement notes are quite scarce relative to those of other countries. There are two general varieties of replacement notes: those that bear the number of the note they replace (Unmarked Replacements) and those that use a separate prefixing system (Star replacements). Prior to 1974 an Unmarked replacement note system was used for all series of Irish notes. In 1974 the Central Bank of Ireland introduced star notes, using a special non-standard prefix, on £1, £5, £10, and £20 notes. 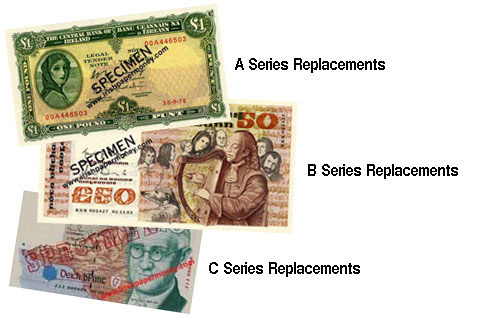 With the introduction of B Series notes in 1976, all denominations used a star note replacement system for replacement of error notes. The links above lead to pages displaying an example of each Star replacement note prefix used on every denomination of Irish Legal Tender banknotes. Below is a list of verified prefix ranges for each date used on replacement notes for all three series of Irish Legal Tender Notes. (ii) Double 0 plus letter prefix (£1, £5 only) - Banknotes printed by The Central Bank of Ireland itself. Types, Catalogue references and running numbers refer to Irish Banknotes, 1999 and later catalogues. TYPE 9 £1 notes, 11.3.63 (01X and 02X prefixes) are often referred to as being replacement notes. They were not printed as such. However, these notes may be said to have been used in a replacement note capacity. They were issued in May 1974, during a shortage of £1 notes, with a pause in Central Bank production operations. Probably 2,000,000 notes issued.